Forensic Linguistics/ Language and the Law is a track in the Research Master Linguistics at VU University Amsterdam. More details on the: Programme, Admission and Application. View/download flyer Research Master Forensic Linguistics/ Language and the Law. Programme, admission and application. Forensic Linguistics is a new and exciting field which has both a narrow and a broad definition. In its more specific sense it denotes the use of linguistic evidence in the courtroom. In its broader sense it refers to all areas of overlap between language and the law, including the language used in legal or quasi-legal settings by participants including judges, lawyers, witnesses, police officers and interpreters. Graduates of this program will have acquired the theoretical background and practical casework experience to be able to analyze disputed texts, recognize a “language crime” such as bribery or threatening communication (nowadays often sent via social media), and identify participants in the police station or courtroom who are at a linguistic disadvantage and therefore vulnerable to miscarriages of justice. WHY STUDY AT VRIJE UNIVERSITEIT AMSTERDAM? • The program in Forensic Linguistics/ Language and the Law is the first program in this area to be offered in the Netherlands (and is currently the only program of its kind in mainland Europe). • The program has close links with the Human Language Technology track (lead by Prof. Dr. Piek Vossen, winner of NWO Spinoza Prize) giving students unique options within the area of Forensic Linguistics. • The lecturers on the program are an international team with extensive teaching experience in the UK and USA, as well as the Netherlands, with research networks worldwide. • Your master’s program will include a period of 2-3 months spent abroad at a university in another country. • Become part of an international group of researchers at Vrije Universiteit Amsterdam! You can develop your own specialized research topic as a PhD student; or you can embark on a career at a research institute. Depending on the country where you are seeking to work you may find employment with a government body, such as the ministry of justice or a forensic institute. Commercial companies also often need linguists with a technical background. Being a graduate in Forensic Linguistics, especially if you have taken courses in linguistic engineering, will certainly enhance your chances. • Applicants must have at least an (honors) Bachelor’s degree in Linguistics, Modern Languages, Cognitive or Communication Sciences or a comparable Bachelors program. • Applicants who do not meet the requirement(s) are also encouraged to apply, provided that they have a sound academic background and a demonstrated interest in and knowledge of linguistics and/or law. 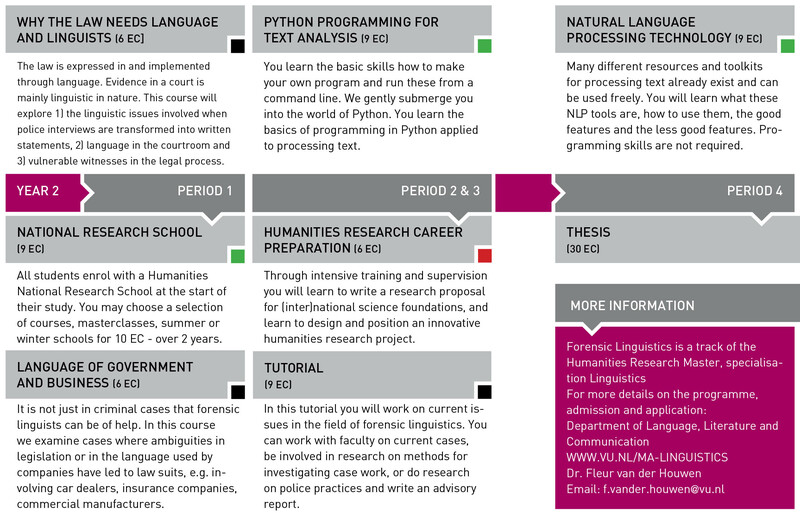 General information on the Research Master’s in Linguistics at VU University Amsterdam.